When is the Best Time to Travel to Kauai? A common question from the Hawaii-bound is when is the best time to visit Kauai or Maui or any of the other islands. The answer is always, “it depends” as each visitor’s situation is a little different but I can point out some things to take into consideration to help make that decision. Usually the first thing to look at when considering when to visit a vacation destination is what the weather will be like. 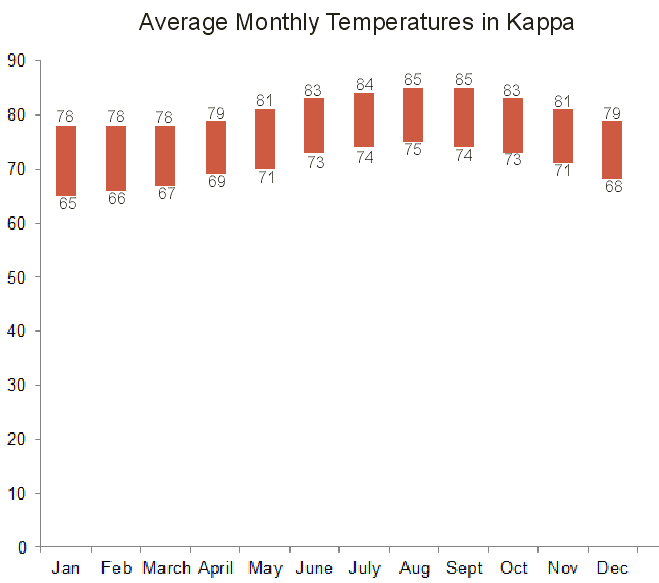 This chart shows the range of average minimum to average maximum for each month in Kapaa. You can see that the temperatures are in the 70’s and 80’s and don’t vary drastically. If you are staying up north in rainy Princeville, the average lows are a few degrees cooler than shown here. If staying down in dryer Waimea, the highs are a few degrees warmer and the the lows are a few degrees cooler but the temperatures don’t vary wildly across the island. You may have heard that it rains on Kauai and that would be true. Rain is the source of the garden isle’s lush green foilage. So when is the rain at its worst? 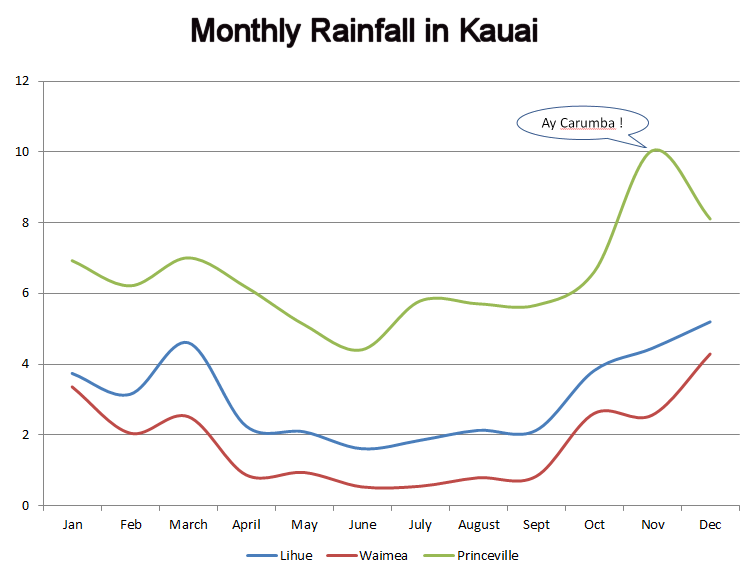 Below is the precipitation data (in inches) for Lihue, Waimea, and Princeville. From this data, November and December are pretty wet months. And there is a Kauai travel tip in there, if its raining while you are in Kauai, you should head to the drier Waimea. Go here for other Kauai rainy day tips. For more information on general Kauai weather patterns go to my Kauai weather page. 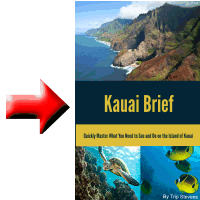 Another big consideration is how busy will Kauai be while you are there. Here is a graph of the number of monthly visitors to Kauai during 2016. 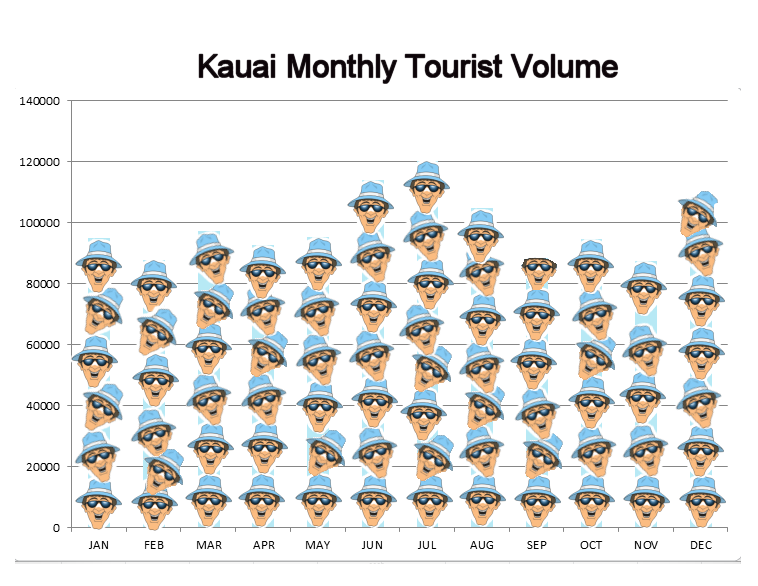 Not surprising, there are a lot of visitors to Kauai during the summer vacation months of June, July, and August. That is a peak time for visitors. The December column is a little misleading in that probably the busiest week of the year is between Christmas and New Years day so the data is skewed during the month of December with many more visitors during the last two weeks than the first two weeks. 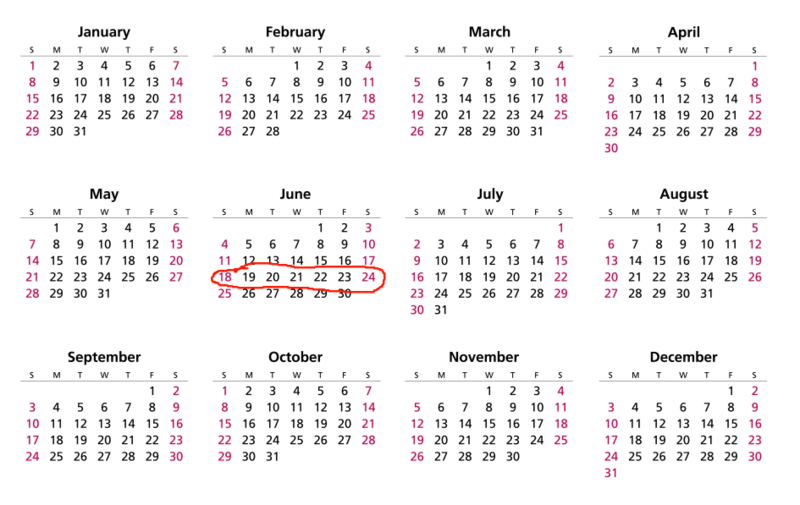 If you would like to visit December during the first two weeks, that wouldn’t be a busy time. When considering tourist volume, most people just consider US travel patterns but you should also consider consider heavy Japan travel times. It is 3734 miles from Tokyo to Kauai and 5,000 miles from New York to Kauai so Kauai is closer to many Japanese than many Americans. One busy time for Japanese travelers is Golden week. Golden week is a seven day period that encompasses four national holidays. For both 2017 and 2018, this time is April 29 through May 5. There will be more travelers coming into Kauai from Japan during that time period. With the bigger crowds come higher prices for lodging with the worst being between Christmas and New Years day. The best lodging prices are typically from mid September through mid November. The actual temperature of the ocean doesn’t vary a lot over the year. With a low of 77 degrees from January through March and a high of 83 in late August/September. While the ocean temperature doesn’t vary much, the surf conditions can vary wildly and you will want to pay attention to them especially since they vary considerably depending on which shore you are visiting. The ocean waves are created by the wind and understanding these weather patterns can help you plan your trip to Kauai. Winter is from November to April. Big, powerful swells pound the North and West facing shores. Winter brings more variable winds and increases chances of longer rain storms. What this tells you is that with the ocean conditions constantly changing, you should always check the surf conditions before jumping in the water. The Coconut festival in Kapaa beach park in October. This event commemorates the importance of the mighty coconut to Hawaii and specifically the industry of the coconut on this part of Kauai. Come and enjoy food, music, hula dancers and more. For more information see the coconut festival webpage. This event is typically held at the beginning of October. The annual Waimea town celebration. The Waimea town celebration is usually the third or fourth week in February. Labelled as Kauai’s longest running festival, I cannot vouch or deny that claim but it has been going for 40 years strong. While it is a celebration of the awesome town of Waimea, you can witness some of Hawaii’s best entertainment and taste Kauai cocktails and cuisine. Also attend the largest Hawaiian rodeo in all of the islandsor witness a long distance canoe race. Other options at the Waimea town celebration include a celebration for King Kaumualii and a film festival. Kauai quilt show. Quilters know that quilt styles and patterns are different based on locations and time periods and Hawaii has its own flavor of quilts. You can witness this Hawaiian flair at the annual Kauai quilt show (in late February or early March). Some of the quilts are donated with the proceeds going to charities. Find more details here. In addition to Kauai-unique festivals, there are specific events celebrated on all the Hawaiian islands. Here is a list of the biggest Hawaiian holidays that you can celebrate on any of the islands–but also on Kauai. Obon. This traditional festival comes from the Japanese immigrants to Hawaii. Obon is a Buddhist festival commemorating one’s ancestors. Traditionally, colorful paper lanterns are hung outside homes to guide spirits back to their families. Throughout the festival, dances are performed (bon dances). The dance almost died out after WWII due to anti-Japanese sentiment but luckily it was restored. At the end of the festival, the floating lanterns are put into rivers to guide the spirits back to their spirit world. If you have seen the movie “Kubo and the two strings”, you saw this several times. In Japan, Obon is celebrated over three days in July or August. The best I can say about Obon in Hawaii is that it happens “during the summer” at different times on different islands so you will need to do your own Google search, if this interests you. Prince Kuhio Celebration. Prince Jonah Kuhio Kalaniana ole Piiko was a beloved Hawaiian statesman and royalty who worked hard fostering Hawaiian culture and values. This celebration honoring Prince Kuhio occurs in late March and is full of Hawaiian specific cultural, arts and music demonstrations. In Kauai, these events are usually celebrated in Poipu, Eleele, Lihue, and Wailua. Lei Day. Lei day is May first beginning at 9:00 am with a lei contest on the second of May. The lei is a central component of Hawaiian culture. It represents “aloha” which is a combination of greeting, love, hope, and joy. Each Hawaiian island has its own color of lei. For Kauai, it is purple (mokihana). Lei day consists of parades, ceremonies, and hula. King Kamehameha Day King Kamehameha was the great warrior that conquered and uinified all the Hawaiian islands. Every year on June 11, King Kamehameha day is celebrated in his honor. One of the biggest events on that day is a parade. On Kauai, this parade is in Lihue and proceeds from the Vidinha Stadium on Hoolako Street up Rice Street to the County’s Historical Building (4396 Rice Street) where there is entertainment, crafts, demonstrations and fun. Do you get in the ocean? If you don’t then you should worry less about the strength of the surf Do you plan to visit the NaPali coast? If you do and you plan to visit it via a boat tour, you will need to visit during the summer months. Parents typically schedule vacations around times when their kids are out of school which coincides with heavy tourist volumes. One thing to consider is to pull you kids from school early in the school year. 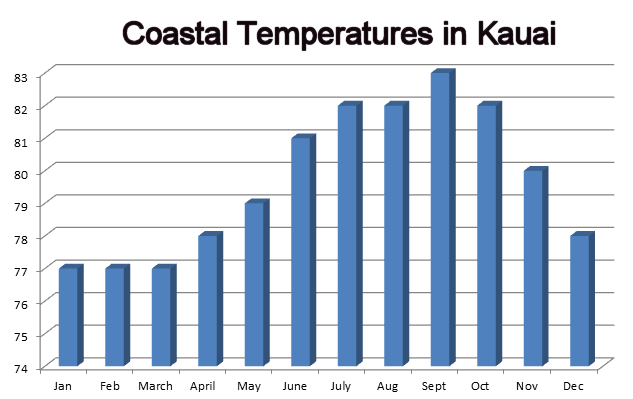 September and October are great times to visit Kaui. The crowds are down and your kids would be able to get caught right back up with the rest of the class when they get back. I know this is not popular advice with many but I believe that done right, vacations are an excellent source of education that can’t be matched with the typical school experience. Some people or websites might suggest that you visit Kauai during the whale migration season (January-April) but I wouldn’t go to Kauai to see the whales. If you are serious about seeing the whales go to Maui on your next Hawaii vacation and get a place on Kaanapali beach. Kauai is not the place to watch the whales unless you take a specific whale boat tour that will take you closer to where the whales are. The AuAu channel between Maui and Lanai is the most protected areas of ocean in the Hawaiian islands and is the migration path of the Humpback whale. That is where you want to be to see the action front and center. Due to family members being in school, you often are limited by school calendars as to when you can visit Kauai. The big choices are then Christmas time, Spring break, or during the summer vacation. While late December is indeed a busy time to go to Kauai, most Kauai cities and resorts have big festivities on New Year’s eve including food, music, dance and of course, fireworks. If school kids don’t play into the equation, September and October are great times to visit Kauai. 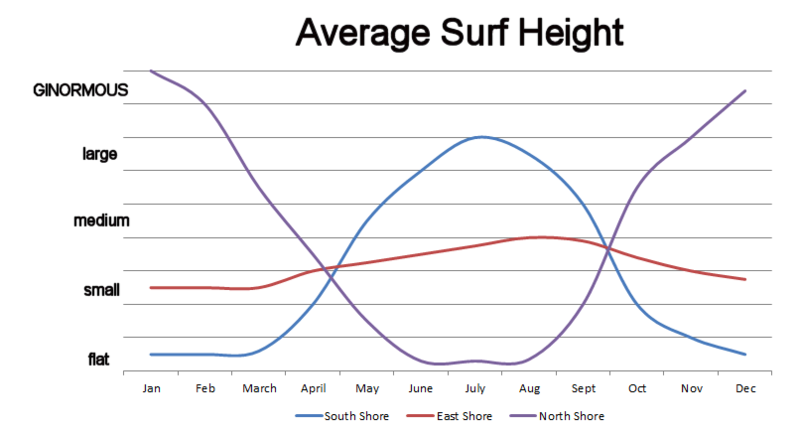 If you plan to spend a lot of time in the water, be sure to check the surf chart to make sure that conditions are calm where you will be staying. And if you want to avoid the rain, remember that the rainy times are during the winters–especially up North near the Princeville and Hanalei areas.